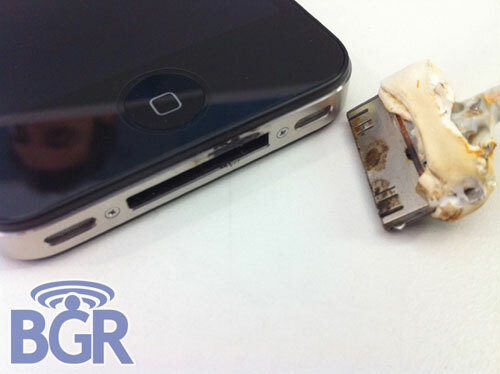 BoyGeniusReports posts pictures of one customer's iPhone 4 having caught fire. The photos come from an AT&T source after the customer brought the iPhone 4 in. It's the first time our guy has seen this happen (us too), but the brand new iPhone 4 caught on fire while being hooked up to a computer using the Apple USB cable that accompanied the device. The customer wanted to exchange the iPhone -- obviously -- for a new, non-charred unit however the AT&T store in question was out of stock. An Apple Store did confirm to our AT&T connection that this did appear to be a defective USB port and not some sort of user error. Our source went onto say that the phone bezel was extremely hot (obviously), and it slightly burned the customers hand. Apple's iPod nano has in the past been linked to overheating and potential fires. Apple issued replacements for those iPod nanos that dated back to 2005-2006. So far, this seems to be an isolated incident.